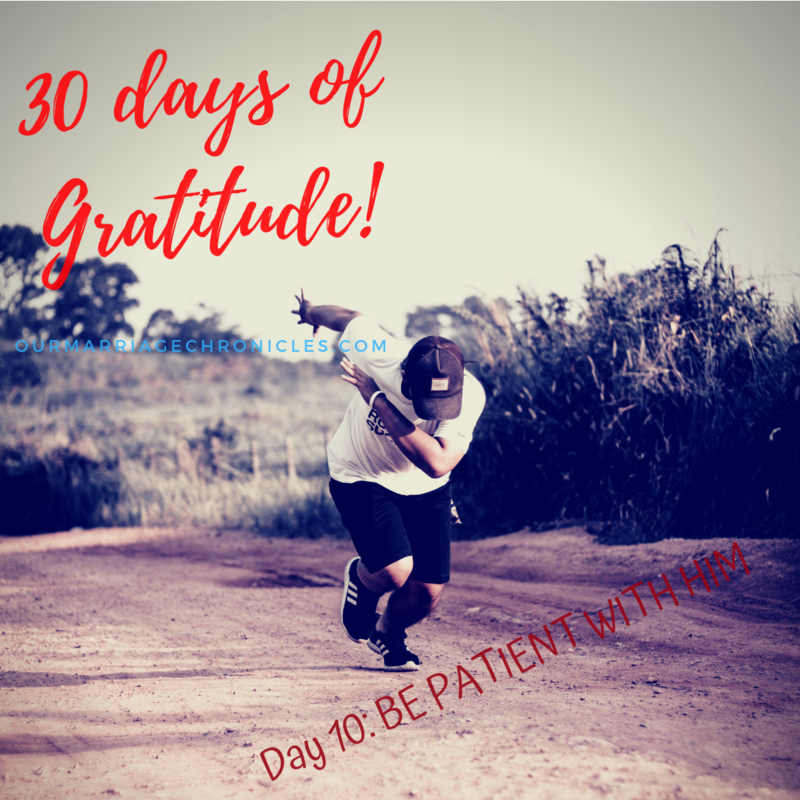 30 DAYS OF GRATITUDE: DAY 10 – BE PATIENT WITH HIM. D.I.Y: Tell him that you appreciate his growth in a, b, c…areas. Make sure you name the areas of growth. Go point: Cheer him on. Be jovial. You know how we want our men to be well put, grounded, focused, achieved, well stocked for the future emotionally, financially and physically? Its all good! Your dreams are totally valid and on point. But you will never find anyone to that level of perfection. You are work in – process, I prefer that! Our husbands, are work in process too! We are practitioners especially in matters family and marriage and no one is 100 percent there. Love is patient. The Lord knows that our ‘selves’ call towards haste and in haste there is much folly and we ruin our lives, then blame the Lord, Proverbs 19:2 – so He teaches us patience through our spouses. You might find that he’s great with the kids, but never follows through a project till the end. He might be a great planner, but poor at executing. He might be great at cooking, but never clears the table. He might be such a romantic guy but never picks his socks, steps on the carpet with the sandals, throws his toothpicks around – and this is not a cliché! Please, put a muzzle around your mouth! Pull the reins and get off the heels! As long as he is fluid, cheer him on, be patient with him. Appreciate his strengths and cheer him on towards greater adjustments. You cannot afford to call him immature just because his socks are lying around. You need wisdom! You need to cut down that pride because trust me girl, you too are very wanting! Love is patient and we need to ask the Lord to give us the patience of molding our marriages and our husbands. He is not figured it all out, and so haven’t you. As long as he is flux, showing gradual change, little by little, inch by inch, cheer his snail’s pace on. Cheer him when he’s cleared the tooth picks and left the dirty utensils on the dining table. Cheer him on when he’s completed one project and 10 are pending. He will get there! Be patient with him! I admit that am never patient with my husband. In almost everything. I really want him to get his acts together and move when I say move. How selfish of me. I hardly notice his pace Lord. I would rather he moves at lightning’s speed – I know you are able to make him so – but I realize it will be my undoing. His pace is my process of sanctification. His pace teaches me patience and in patience you build my character and in character you build a greater hope in you, on which I should anchor myself on. A hope in you Jesus. Give me a heart like yours. A heart of patience. A heart of gladly bearing it all – as I wait on you. Previous Post30 DAYS OF GRATITUDE: DAY 9 - MAKE HIM YOUR FIRST PRIORITY.